So we have been working on this project for quite a while. I purchased the frames at Michael’s with the 40% coupons. The frames had mats already in them,which were white and black. 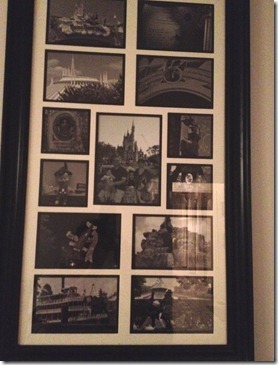 The pictures are all pictures we took during our many Disney trips, but there are plenty to be found online if you didn’t have any of your own. I had them all printed in black and white, during one of the times Walgreens had 40% off photos. I ended up getting the frames for about $25 each and the pictures ended up being about $15 after the discount I’m sure there are ways to do this less expensive. 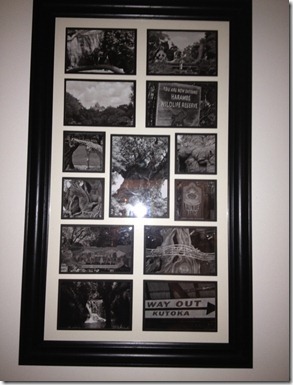 Originally I was just going to do one frame for the CA parks and one for the Florida parks but as they all have their own focal point I changed my mind. So this project cost me about $315. 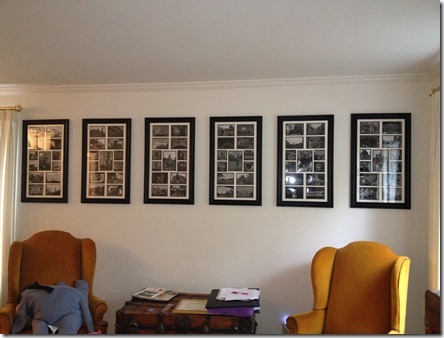 I bought a frame every couple of weeks with the 40% off coupon as I could not afford to buy them all at the same thing. The only thing I caution is to make sure its not a frame that will only be in stores for a limited time. These were issued for graduation time, so when I needed the last two, I had to call around and find others because the stores weren’t carrying them any longer. 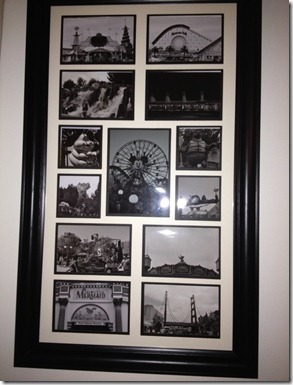 The 5 X 7 in the middle is the main focal point of each park. The other pictures are pictures from around the park, not pictures of the family. 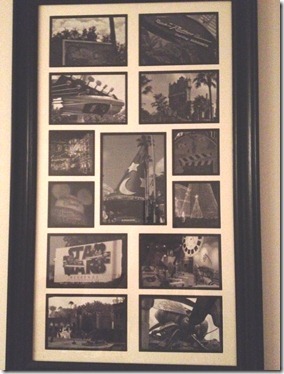 Pictures of our favorite rides, or special areas of interests in the parks. There are 6. One for each of the 4 WDW parks in Florida and 2 for the parks out in California. 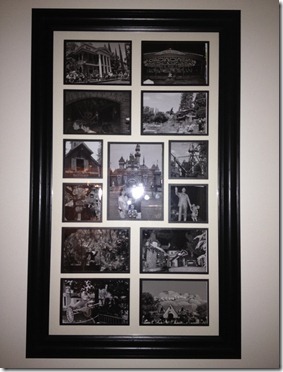 I got this idea when we were out in California at the Disneyland hotel. 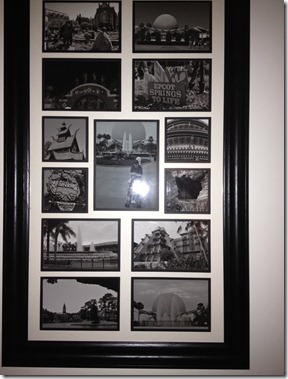 Some of the rooms had a smaller collage of some of the focal points in the parks in black and white. I have been wanting to do it for the last year and a half since our trip out there and now that we are in the new house they are completed and hung up! I hope you like them! And now the 4 WDW parks: Magic Kingdom, Epcot, Animal Kingdom and Hollywood Studios.